Tata Motors looks to shed its old skin, with more than a little help from Jaguar Land Rover. Ranjit Yadav, President, Passenger Vehicles Business Unit, Tata Motors, with the Zest. "We have to bust some perceptions. Perceptions come out of old realities," says Yadav. Photographs by Pawan Dagia /Auto Bild. In the summer that is still refusing to go, Tata Motors organised a test drive of the Zest, its new compact sedan, for the financial community, mainly bankers. Car companies often do this. Not many of these test drivers buy the car. But if they like it, they find it easier to approve loans to those who do, as well as to dealers. "They loved the vehicle," says Ranjit Yadav, who runs the passenger vehicles part of the company. "They said it's not a Tata car." And he liked it? Wasn't he offended? "I liked it, because it is a new Tata [Motors]. We are breaking a few myths." Yadav has - as they say - been around the block. 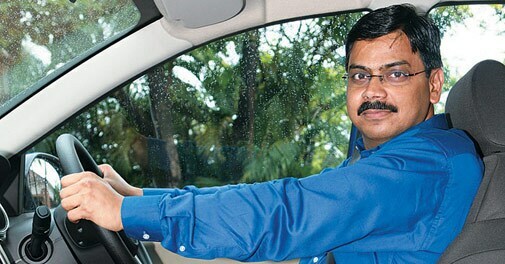 He came to Tata Motors in October 2012 from Samsung, where he headed the mobile phone and information technology units. He has also been with Hewlett-Packard Asia Pacific, Philips India, Computer Point India, and Ponds India. How would a Tata Motors lifer react? Girish Wagh, who heads its programme planning and project management, is just that, and a bit more. He has been with the company for 24 years. His father, too, worked in Tata Motors' engineering research centre, part of the unit the son now heads. Wagh says he will advise his children to join the company if they asked for his advice because he relates to the Tata value system. His two sons, 13 and seven, have some way to go before they approach their father for such an advice. But what would be Wagh's reaction if someone, with the intent of praising a Tata Motors car, says it does not feel like a Tata car? "I will feel good. Tata is a revered brand. We are proud of it. Most Indians want the Tata brand to succeed. But, with the changing environment, they also want the brand to change depending on the industry we are playing in." As Yadav says: "We have to bust some perceptions. Perceptions come out of old realities." The old reality is not pretty. Not too long ago, Tata Motors vied with Hyundai India for the position of number two to Maruti Suzuki. For some time, its position has been in free fall. It sold fewer cars and utility vehicles in 2013/14 (142,000) than it did 10 years earlier (179,000). Eleven percentage points were shaved off its share of the market in seven years as it plummeted to 5.8 per cent in the 12 months to March this year. The months since have not been any better. Honda India and Mahindra and Mahindra now sell more passenger vehicles than Tata Motors. Toyota, too, though facing its own struggles with volumes, manages to forge ahead now and then. And yet, brokerage houses - Motilal Oswal, Karvy, Kotak Securities, and Edelweiss - maintain a "buy" recommendation on the stock in reports that came out in the wake of the company's first quarter results on August 11. A fifth, Prabhudas Lilladher, says "accumulate". The stock has already risen 36 per cent since January 1 this year, closing at Rs 511 on August 22, the day this article was finalised. The target prices of the five brokerages range between Rs 521 and Rs 612, with Motilal being the most optimistic and Prabhudas the least so. Cyrus Mistry, chairman, Tata Motors says the company is at an inflexion point. Tata Motors acquired JLR in June 2008, when the British company was in a shambles. Since then, it has turned around, buoyed by rising sales in China, the world's largest market for automobiles. JLR is now shoring up its owner's numbers, bringing more than 80 per cent of the company's total automotive revenue. Ambit Capital Markets, as reported by Mint newspaper and financial website moneycontrol.com, estimates the value of Tata Motors's domestic auto business at just Rs 20 a share. Two of its subsidiaries, Tata Motors Finance and Tata Technologies, are valued at Rs 30 a share, giving the company's standalone business the value of Rs 50 a share. JLR, according to Ambit, is worth Rs 500 a share. That puts 91 per cent of the company's value in JLR. To Karvy, Tata Motors's standalone business is worth Rs 61 a share and JLR Rs 533. As the stock market and analysts watch the numbers, an even bigger change has taken place in the company, again with help from JLR. Its first manifestation is the Zest, the compact sedan. The Zest joins the ever growing number of sedans that are shorter in length than four metres and therefore entitled to a lower rate of excise. Tata is already present in this segment with its Indigo CS, but Zest is something else. It is the first new car to come out of Tata Motors in nearly four years. It comes on the back of a flop like Aria and lukewarm sales of the Nano. The Aria was to create a new segment of a high-end crossover vehicle. The Nano, of course, was to trigger a global revolution and establish India's supremacy in frugal engineering (read all about it here The new Nano promise.) Given the high hopes, the disappointment would be proportionate. The Zest joins a segment that is already there, but it aspires to bring to this segment things that are not there at the moment. It is also a new car searching for new customers. "This is the beginning. You will get to see what we have been doing the last three to four years. We have not been sitting around," says Timothy Leverton, head of advanced and product engineering at Tata Motors. Chairman Cyrus Mistry said in a letter to shareholders in July: "The company is at an inflexion point with its entire product portfolio being revamped with relevant and exciting products for our target customers." The target customers are now a little different. Since it came out of an oyster at the Auto Expo in New Delhi in 1998, the Indica, Tata's first passenger car, has been a darling of fleet operators, who have been enamoured of its roominess, low cost of running, and sturdiness. In spite of that, or perhaps because of that, those who want to drive the car for their own use have been able to resist the charm of the Indica and many other cars from Tata Motors. The Zest was launched on August 12 at prices that will make those going for Maruti's DZire, Hundai's Xcent, and Honda's Amaze at least pause and turn to take a look. The Zest, and the Bolt, a hatchback derived from it that is slated to roll out soon, target buyers who want to buy a car for their own use, who look for a high quality of drive and performance. The Zest comes in both diesel and petrol versions. In a departure from the Indica-Indigo legacy, the petrol one appears to be getting more attention. It is fitted with a new engine, Revotron, a 1.2 litre, turbocharged, petrol unit that the company has developed. You may have seen the television commercials. Starring Narain Karthikeyan, the first Formula One driver from India, it talks about the benefits of the new engine and stands out among car advertisements that show people looking happy even as their cars do astounding things. Revotron enables three different drive modes in the Zest: sport (if you are feeling peppy), eco (if you are driving on the highways), and city (if, at the end of a day at work, you just want to take it easy and smooth). Girish Wagh, Head, Programme Planning and Project Management, Tata Motors. 'Most Indians want the Tata brand to succeed. But, with the changing environment, they also want the brand to change,' says Wagh. The diesel Zest does not have different modes, but it does have AMT, the technology that goes by the confusing name of automated manual transmission and is selling like hot cakes in Maruti Suzuki's tiny, little Celerio. The Zest brings AMT to the compact diesel sedan segment. AMT is poor man's automatic transmission. It has a hydraulic accelerator that takes on the job of shifting gears and allows you to control it electronically. Alongside, there is also manual shift available if you want it. This transmission system can be built at a third of the cost of the real automatic transmission. Both petrol and diesel Zest are packed with features. That is the new battleground for car companies as consumers focus less on the engine's cubic capacity and peak power delivery and more on touch screens, automatic climate control, steering mounted controls, good interiors, and a great entertainment system. (For proof, look no further than the new Elite i20 from Hyundai). The Zest has all of these, and also gives a better drive than the Indica-Indigo family, making you feel much more in control. It just feels much better put together. Much of that has been achieved with JLR's help. The British subsidiary infused a new thinking in Tata Motors, which raises quality consciousness from the time a project is conceived. At each stage care is taken that the project is executed in a manner that each design and engineering target is met. W Liedtke, who recently retired as the head of quality at JLR, has mentored Tata Motors' team and helped them evolve a rigorous, five-level framework. When a plant reaches the fifth level, it stops creating defects. One of the plants has already crossed Level 2. 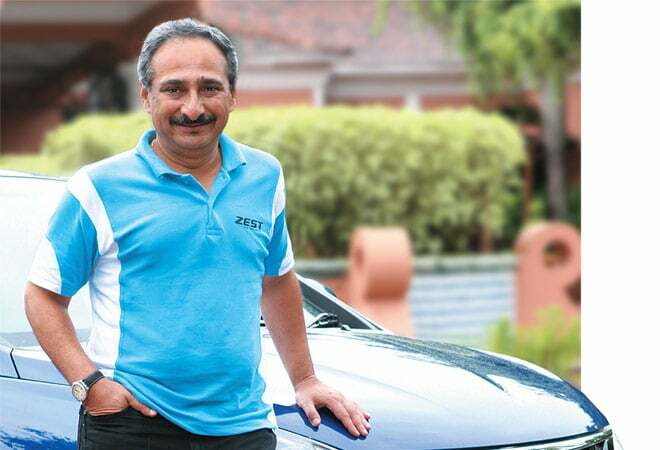 The design team, which has grown from 35 people to more than 200 in four years since Leverton joined the company and is headed by Pratap Bose, believes the Zest will create a new signature identity for Tata Motors. "When you are behind the Zest or in front of it and looking at it in your rear view mirror, you will be able to tell it is a Tata Zest," says Bose. Still, is all this enough to overcome a decade and a half of old reality? The smattering of motoring journalists attending a test drive in Goa in early July had the same scepticism: will this come to be known as the new Indigo? "I have to face a lot of sceptics, all the time," says Yadav. Outside the company or inside? "Everywhere. When you want to change things, you face sceptics." Hopefully not too many at JLR.